This year, Sunday 11 November 2018, marks the centenary of the Armistice and the end of military activities by German forces. There are an estimated 16,000 villages across England. In the First World War every village saw its young men (and some women) leave to serve their country. Over 700,000 Britons died, yet 53 village communities suffered no fatalities – all those who left for war returned home alive. These places became known as ‘Thankful Villages,’ a phrase coined by the writer and historian Arthur Mee in the 1930s in his guides to the counties of England, The King’s England. Wales has two such villages. Scotland and Ireland have none. Certificate given in 1919 to Private Joshua Jameson by the villagers of Hunstanworth, marking his safe return from the First World War. Courtesy of Elfrieda Waren. Joshua was one of Edward and Anne Jameson’s 13 children. At the outbreak of war, the parents (who had already lost four children at a young age) had to watch as four of their surviving sons, including Joshua aged 16, went off to fight, along with a fifth villager, Arthur Taylor. The five young men were the only villagers serving in the First World War. John Hugill – Catwick’s blacksmith. Photo by kind permission of his grandson, John Hugill, who has preserved his grandfather’s legacy by remounting the horseshoe and coins on a modern plaque. One hundred years ago John Hugill – Catwick’s blacksmith – nailed a horseshoe and thirty coins to his forge doorpost during the First World War to represent the village men who went to war. The blacksmith fixed the coins – pennies and halfpennies, plus a German and Swiss coin – round the horseshoe. Each represented one of the thirty men who left Catwick to serve their country and who all returned home. One man, Joseph Grantham, ‘left an arm behind’ according to writer and historian Arthur Mee. The blacksmith cut a notch in one of the coins to represent the lost limb. In the Second World War another thirty village men served in the armed forces and, again, all returned safely making Catwick a Doubly Thankful Village. Catwick road sign marking its distinction as a Doubly Thankful Village. © Creative Commons. Roll of Honour in St Peter’s church listing the names of the 18 local men who went to war and who all returned home. © Angela Benford. This is an unusual plaque in that it indicates with the letters C, W and G after their names which of the men were Captured (one), Wounded (one) or Gassed (three, one of whom was also wounded). This refutes the occasional claim that those in Thankful Villages survived only because they were serving in safe places away from frontline action. These men were clearly fighting on the battlefield. The 17 foot Knowlton commemorative cross in the style of a medieval lantern, displaying carved figures of a soldier, nurse, victory and a casualty. © Kent Fallen. In 1914 the local Kent newspaper, the Weekly Dispatch, ran a competition to find the ‘Bravest Village in the United Kingdom.’ This was defined as the one from which the largest proportion of its men had volunteered to serve in the armed forces before March 1915. Inscription at the base of the column. Designed by notable British sculptor George James Frampton. © Kent Fallen. Almost 400 villages competed. Knowlton was declared the winner, with 12 men enlisting from a total population of thirty-nine. The prize was the granite cross, unveiled on 1 September 1919. The village hall, Upper Slaughter. Although the village name implies death, the word derives from the Saxon ‘slohtre’ meaning muddy place. © Creative Commons. This village hall displays a simple wooden plaque recording the 24 men and one woman who went to war but who all returned. In the Second World War, 36 joined up and 36 came home making Upper Slaughter another Doubly Thankful Village. A Major EFB Witts granted a 99 year lease of the village hall in 1920 and there are five Witts listed among the 25 names on the memorial plaque. One was Agnes Witts, a member of the Voluntary Aid Detachment – a civilian unit providing nursing care to military personnel. She may have been an ambulance driver for the unit. The village’s soldiers served in regiments ranging from the Gloucestershire Regiment and the Tank Regiment, to the Coldstream Guards and the Cameron Highlanders. Ousby is a Doubly Thankful Village – all 13 men who served in the Second World War also came back. A stone memorial, topped by a lantern, in St Mary the Virgin churchyard. © Philip Pankhurst. Middleton-on-the-Hill is a Doubly Thankful Village. Memorial (detail), St Mary the Virgin churchyard. Public Domain. Engraved brass memorial plaque within the Holy Trinity church. © Rutland Remembers. This plaque recognises the 11 men and two women who went to serve in the First World War and who all returned. However, nearby is a hand-written ‘Roll of Those Serving in His Majesty’s Forces in the War of 1914’, which names twelve men and two women. The twelfth man was Private William Haines listed as killed in action. However, as it was subsequently determined that he was a visitor to Teigh rather than a resident, Teigh retains its status as a Thankful Village. 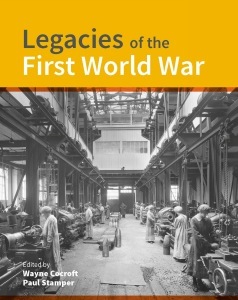 The latest issue of our online magazine Historic England Research is a First World War special. You can access the issue for free on our website. A new publication uncovers the physical remains left across England by the First World War. Click here to take a look inside the book and use discount code HE1WW for 20% off.